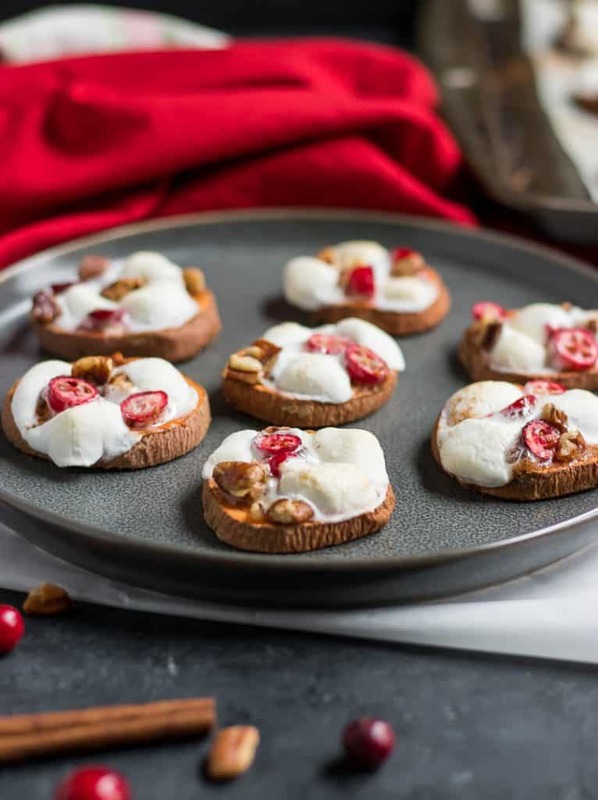 Think sweet potato casserole in a simple bite sized appetizer. 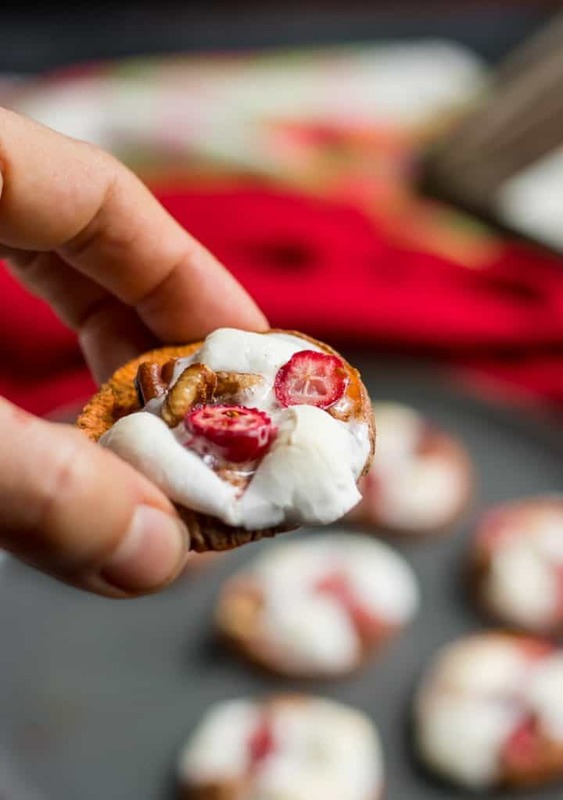 These Cranberry Pecan Sweet Potato Bites are topped with pecans, cranberries and gooey marshmallows for a delicious Thanksgiving or holiday recipe! It’s kind of crazy. I barely even think about cranberries most of the year and then November hits and I go on a full on cranberry rampage. Cranberries literally in everything–for most people it would be too much. But my taste buds crave all the little red berries all November and December and it’s only right to feed my cravings, right?! I have already pulled out everything to make my favorite Cranberry Orange Chia Jam. I also just finished up a batch of my Roasted Sweet Potato Cranberry Quinoa. Yes, I know, Thanksgiving isn’t even here yet, but I gotta enjoy it all season! I found a few fun facts about the origin of the name of the fruit that’s all I really thought I would share. The word cranberry is actually from the word “craneberry“–they were called craneberries because fo the way the flowers dipped down and resembled the head of a crane. Cranes just so happen to feed on cranberries, so that makes sense. They have also been known as bounceberries because apparently they have a really nice when fresh. And since bears love them too, they have been known as bearberries. Was that so bad? I mean, you never know when you are gonna need that info, especially if you are looking to win trivia night! As I was saying, Thanksgiving, it’s coming, and now we need all things cranberries/craneberries/bounceberries, whatever you like to call them! Oh, and don’t forget sweet potatoes–but I eat those ALL THE TIME so they aren’t quite as seasonal for me. It’s kind of crazy, as a kid, I turned my nose up at sweet potatoes. I wouldn’t even touch the sugary, marshmallow topped sweet potato casserole if you paid me! And there was plenty of money flying around the holidays to do so when we were growing up. My uncles used to round up all the kids and sit us down and then offer to pay a dollar to the person who could be quiet the longest. Yep, family, right?? And they were sneeeeaky. They would try to get you. You’d try your very best and then they would say, “Hey so and so, when is your birthday?” Of course whoever they asked would proudly tell them the date only to realize they had just lost their chance at the golden dollar! One year it was down to the last two–my cousin and myself, and they upped the level of difficulty. Not only did you have to be quiet, but you also couldn’t move. If you know anything about me, I cannot sit still as an adult and it was only all the more challenging as a child. Guess what, though? I won!!! I went home a dollar richer that Thanksgiving! The crazy thing?? That whole story came just from thinking about sweet potato casserole. Food does that. Especially holiday and seasonal food. 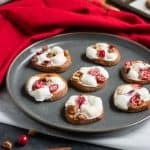 Sweet potatoes and cranberries are tied deeply to Thanksgiving and the holiday season but in so many ways it is the memories more than the actual dishes. Sure, that sweet potato pie or that cranberry sauce tastes amazing, but there is a comfort we find in these dishes. They taste like home, or they taste like a cozy dinner together, they taste like togetherness. 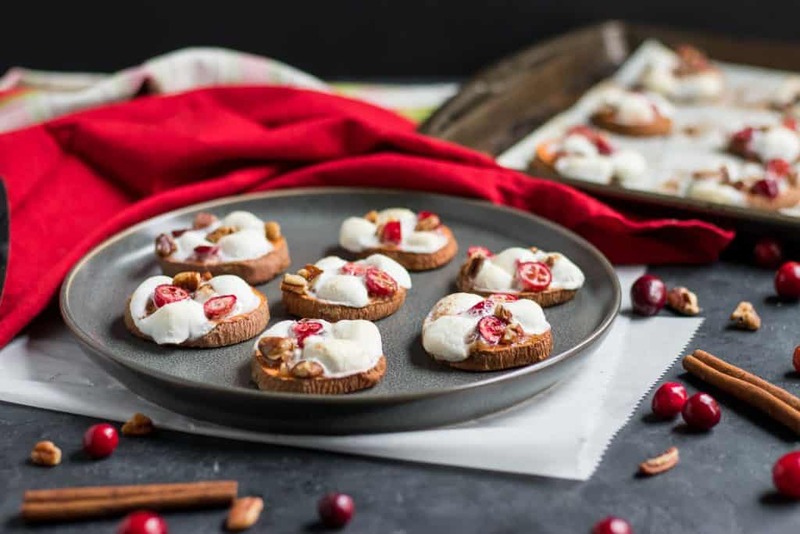 So let’s kick off the holiday with a delicious appetizer or another dish that can be added to your spread and continue to help you make so many beautiful memories. My goal for this recipe was to have something similar to what you find in sweet potato casserole, but in finger food form. There are so many parties and gatherings over the holidays and we are always looking for fun new apps to bring along. This is your newest option. And you don’t have to tell a soul that they are so simple to put together. I will say that the perfectionist in me had some issues when I laid out the items on the sweet potato rounds only to have them come out looking like a hot mess. Marshmallows have a mind of their own so you are essentially at their mercy–but even the not so pretty ones taste mighty fine so I was able to let it go, a little at least. These are great out of the oven however, you don’t have to eat them warm which is nice considering you may have to travel with them. I ate them from the fridge happily for several days. I would say if you are heading to the party with them to just take them with you from the oven. It will give the marshmallows time to set. While I typically add a bit of olive oil to sweet potatoes when roasting them, when I did that the first time for this recipe, it made them way to oily/wet once the marshmallows and other toppings were added. I tried this with big marshmallows as well–I will save you the trouble, not worth it. They balloon up so big and everything pops off. Make sure to cut the sweet potatoes thick enough. It will make them much sturdier to allow them to be true finger food. If you prefer your marshmallows darker, just let them stay in the oven a bit longer, but once the browning starts, it goes fast so keep a close eye on them! Other than that, let the festivities begin! Here’s to a season of food, friends, family and fun! Try to leave as much stress behind as you can–don’t worry, we will talk about that more later! Slice sweet potatoes into rounds, about 1/2 inch thick. Line on parchment lined baking sheet. Bake for 12-15 minutes, until softened, but just before they are soft enough to serve. When sweet potatoes are ready, remove from oven, and sprinkle with cinnamon and sea salt. 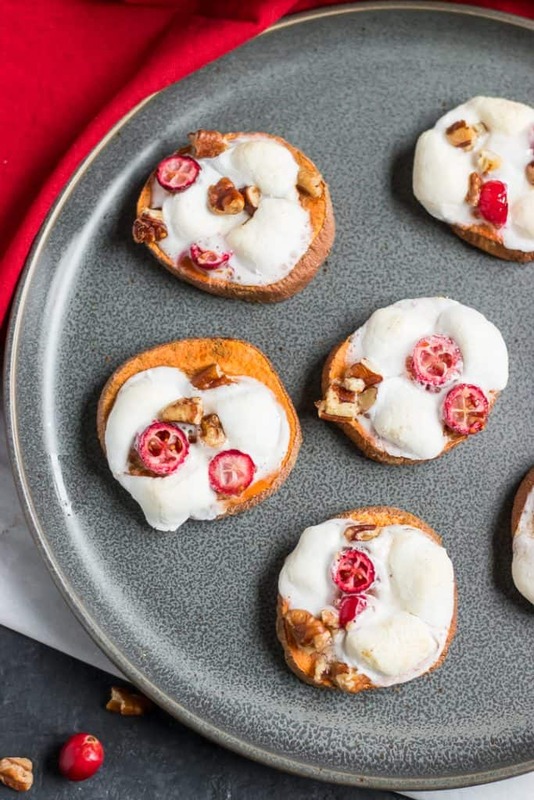 On each sweet potato round, top with 2-3 marshmallows and a small spoon of cranberry pecan mix. This part can be tricky because the cranberries will want to roll away but just place them where it makes the most sense. Set the oven to 350°. Place the baking sheet back into the oven and bake another 6-8 minutes or until the marshmallows are cooked to your liking. Remove from oven, allow to cool and serve! My favorite new way to enjoy sweet potatoes – thank you!! 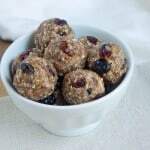 Not only are these beautiful, they taste delicious and are fun to make and eat! 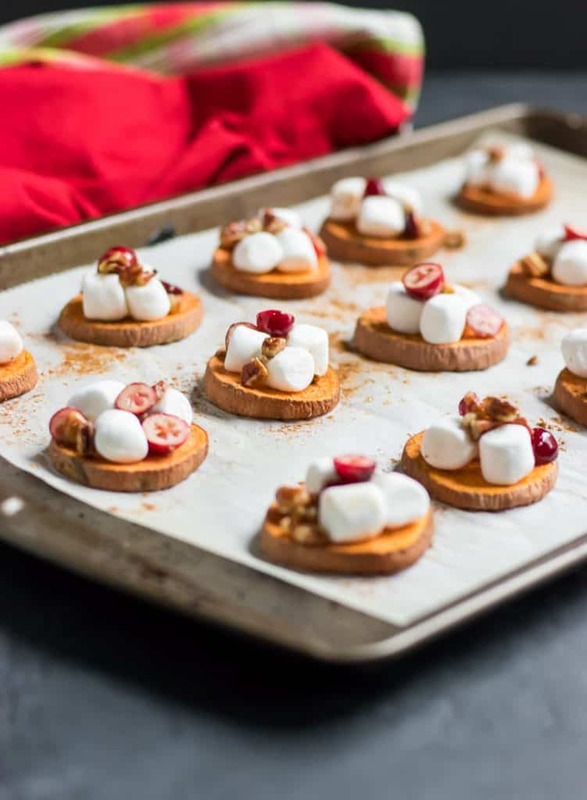 The marshmallows pair so well with the sweet potatoes. 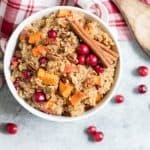 What a creative idea and a great alternative to sweet potato casserole. LOVE these! Great idea, bookmarking for next week!